A tagine is a Moroccan stew made by slowly stewing meat together with vegetables, olives and spices. This dish, accompanied by couscous, makes a perfect meal for the winter months. Lamb tagine spiced with cumin, coriander, chilli, ras el hanout and star anise, served with an apricot, fig and pistachio cous cous. Morrocan tagine of winter vegetables served with a saffron spiced cous cous and minted yogurt dressing. Spiced kefta meatballs made with beef served in a sauce of fennel, peas, red onion, tomato and saffron. 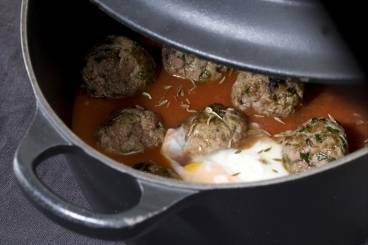 A spicy Moroccan tagine with meatballs, topped with egg and a dash of cumin. A great combination of lamb, nut and dried fruit fruits goes into this classis Moroccan dish. Slices of grilled halloumi flavoured with Moroccan ras el hanout and served with a courgette, parsnip and chick pea tagine. The cous cous is flavoured with broad beans, feta and peas. A mild lamb tagine served with a parsley and coriander flavoured cous cous. Chicken thighs cooked in a fragrant broth until tender with green olives and sweet sultanas. A mildly spiced lamb and apricot tagine served with preserved lemon and pomegranate couscous.